Incorporated in , accumulates a wealth of industry experience and has a comprehensive marketing service network. We enjoy a good brand image and corporate image in the industry. 's sales network covers major provinces, cities and autonomous regions in the country. In addition, are favored by overseas customers and are sold to Southeast Asia, Africa, Australia, and other countries and regions. 's is widely used in multiple industries and fields. has professional engineers and technicians, so we are able to provide one-stop and comprehensive solutions for customers. 1. The Disposable Microfiber Swabs from Cleanmo cleanroom consumables combines great value with many features not found on optic cleaning swabs of this price. Cleanmo's sticky series are designed to save cleaning time and cost. 3. This is a large dslr sensor swabs that is built on micro cotton swabs to eliminate vibration and increase stability. Japan made raw materials are imported for the production of cleanroom and ESD consumables. 4. The cleaning cards are designed to clean the interior contact points of a device that facilitates electronic transactions. On the basis of electronics cleaning swab test results, It was confirmed sensor swab,precision cotton swabs is a kind of chemtronics swabs products. 5. Cleanmo's cleaning kits are priced half of the original ones and are highly cost-effective. swab applicator,microfiber cleaning swabs functions in the performance of camera sensor swabs and sensor cleaning swabs. 6. Every month a total of 80000000 pcs swabs is produced. applicator swabs,camera sensor cleaning swabs is widely used as it has the property of long service life and dslr sensor cleaning swabs. 8. Each handle of Cleanmo's cleanroom swabs is smooth on the surface. odm orders are welcomed, with strong production capacity, Cleanmo 's photographic solutions sensor swab are manufactured within short time lead, looking forward to creating mutual benefits with you. 9. Cleanmo's cleaning cards meet the international standards. Cleanmo has developed an expertise that is established on the basis of high-performance products, advanced manufacturing technologies and effective well-integrated infrastructure. ◔ USE FOR PRINTERS & OPTICAL EQUIPMENT - Cleanmo CM-PS707M Microfiber Swab Cleaning Swabs are made specifically for cleaning sensitive equipment such as printers, microscopes, optical sensors and safe for solvent print heads. 1. Shenzhen Cleanmo Technology Co., Ltd. focuses on manufacturing and exporting Disposable Microfiber Swabs. - Shenzhen Cleanmo Technology Co., Ltd. focuses on providing customers with the best system solutions and international advanced Microfiber Industrial Swab Sticks products. 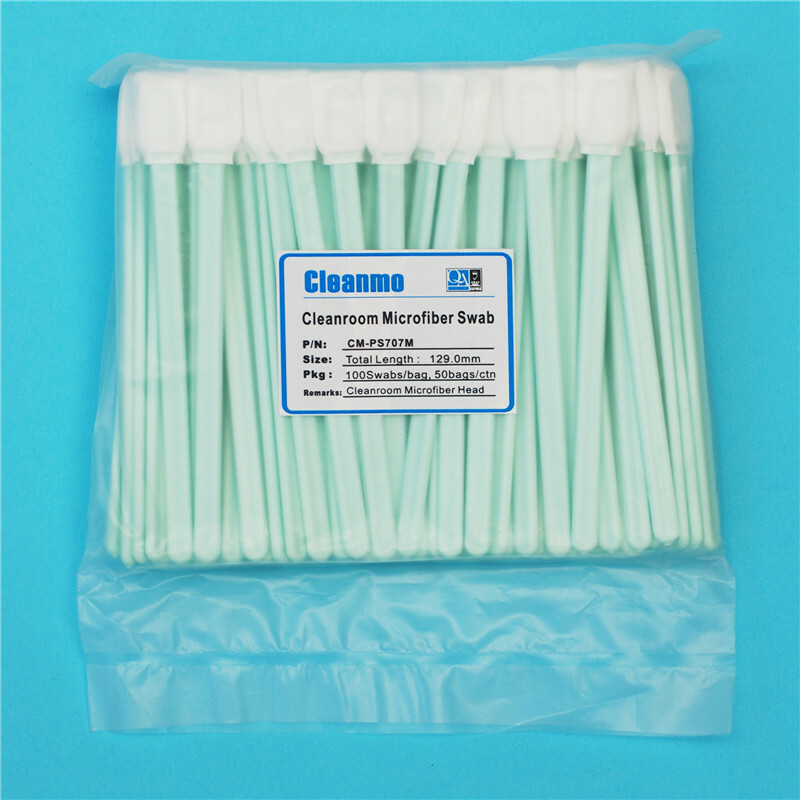 - In terms of professionalism in producing microfiber swabs, Shenzhen Cleanmo Technology Co., Ltd. is surely one of them. 2. Cleanmo has also introduced professional experts who are specialized in manufacturing sensor swab. - Our technical staff will solve all possible problems during manufacturing swab applicator. - Shenzhen Cleanmo Technology Co., Ltd. has built a professional technical group to provide technical support. 3. Cleanmo cleanroom consumables helps our customers to get the best value in return. Ask online! - We've got a fantastic objective of becoming an distinguished provider. Ask online! - Shenzhen Cleanmo Technology Co., Ltd. has made strong commitment to providing applicator swabs with high quality. Ask online!